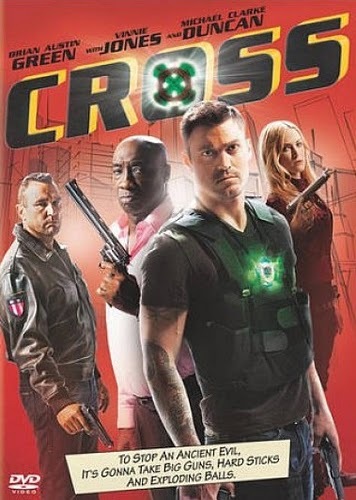 Cross deals with a LA based vigilante team led by Callan (Brian Austin Green), a man who bears a cheap, Celtic necklace that grants him leftover superpowers from Green Lantern and Iron Man. When Vinnie Jones shows up with an ancient Egyptian staff that could end the world, it's up to the team to stop him with a lot of guns and very little special effects. You can find this non-action packed mess available for streaming right now on Netflix, VUDU, and Amazon Instant Video. However, you're probably better off just listening to our show. We have way cooler superpowers. Our special guest this time out is Kingsley Crabtree, who previously assisted us with the flushing of Hooking Up and Cherry Bomb. Kingsley is a reviewer for the alcohol inspired website, Movie Boozer.com, and just couldn't wait to get dirty with us again here in the Restroom.